Gwynne told me I should have written this post last week, she said that most people will pick up their wines for Thanksgiving over the weekend. I'm counting on you all being the last minute shopping kind, and so for those of you who either don't have it all that together, or haven't made up your mind about what you'll pair with Thanksgiving, this is for you. Before I go on though, I should say I'm a firm believer in that "drink whatever you like" ethic. If you like something, why not drink that, who cares what anyone else thinks? Thanksgiving marks the beginning of the end in terms of the reasonable person standard for how much food one ought to consume in a sitting. For me anyways it's often the kick off to a long slide down a slippery, gluttonous slope that doesn't stop until sometime shortly after the New Year. Luckily it's after cyclocross season has ended, or at least almost ended. A uniquely American experience, except Canada also does it, Thanksgiving's roots actually run deeper than it's assumed Pilgrim celebrations in Massachusetts and in fact may have roots as far back as the 1570s and the Dutch city of Leiden. While some of that is still up for debate, what's not is that it's serious chow time come Turkey Day. When it comes to the perfect Northwest Thanksgiving, the perfect source of Northwest food friendly wines is Oregon. Why Oregon? Acid, acid, acid. Acidity in wine does two things in relation to food that can enhance the overall experience. For one, higher acid wines actually cause you to salivate, they can literally be mouth-watering. This, combined with acid's ability to cut through heavy foods, creamy sauces and rich fatty meat, a staple of the holidays, make wines with higher acidity a better holiday match-up. As it stands in the Northwest you don't get better acidity than what Oregon wines from the Willamette Valley bring to the table. With it's reputation for Pinot Noir you'd think my work was done when it comes to Thanksgiving wine pairings. Pinot Noir has great acidity after all, but that's too easy. This holiday season we're going Oregon, but we're also going outside the box. 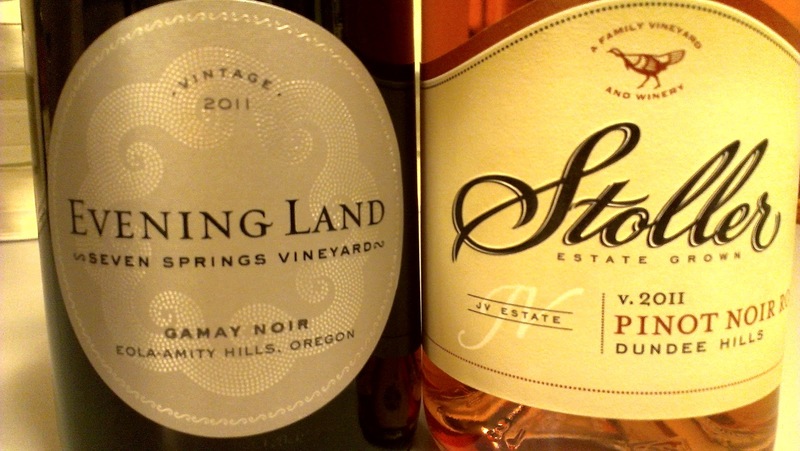 These wines I'm recommending won't just taste great with your turkey and fixings they'll make you seem cool, these aren't your everyday Northwest varietals. Find me someone who says they don't want to seem cool and I'll show you a liar; so here goes. Kick off the evening with an air of celebration and nothing says celebration like bubbles. Oregon probably doesn't produce enough bubbles. Those that it does produce are typically quite good, in this case it's better than that. The Ecosse Non-Vintage Brut is a sparkling revelation, I don't use that word lightly. Two things here make it fantastic, it's from Oregon, so that means, great acidity in the Pinot Noir and Chardonnay that's used to make the wine. The same grapes with great acidity grow in Champagne, which is the only place that produces Champagne by the way, but you probably knew that. Where Oregon gets sparkling wine absolutely right and California misses is that "fruit-forward" signature, crisp fruit aromatics of cut apple mingle with a fresh baked bread aroma that is thanks to this bubbly spending five years on the lees. The mouthfeel is classically done and the folks at Ecosse have a winemaker from Champagne pulling the strings. The crazy thing about how good this wine is that you can find it under $25 retail, in Seattle Esquin has it and in Oregon/PDX you can find Ecosse at Great Wine Buys, Storyteller, Liner & Elsen, and a handful of Fred Meyers throughout the Willamette Valley. The friends you dine with will think you're some kind of Jedi if you come correct with this bubbly. And maybe you keep the price to yourself? 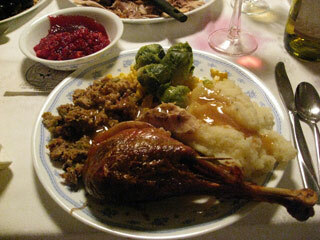 In between niceties and the bird there are a load of side dishes to survive. I make a killer green bean casserole wherein I make the cream of mushroom soup from scratch. Yes, I don't mess around. But enough about me. These side dishes are heavy, creamy and loaded with goodness. They also need that zingy Oregon acidity. 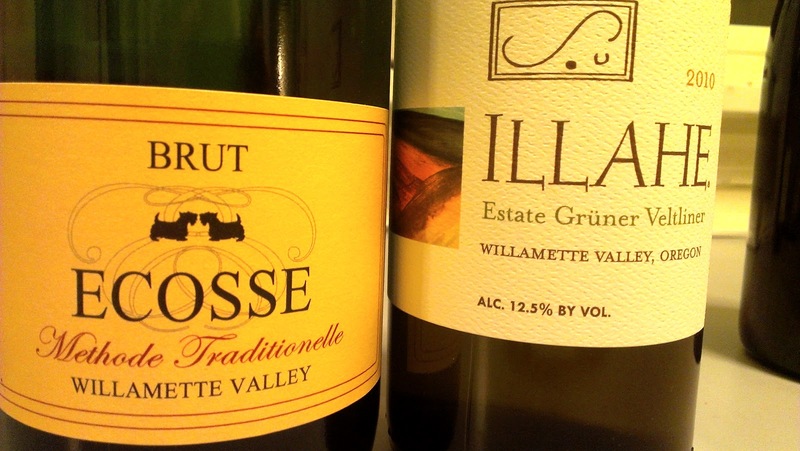 Enter the Illahe Grüner Veltliner, a wine that hails from Austria, this Grüner shows the range that Oregon offers. I'm drinking the 2010 but you can look for 2011 as well. Where Grüner differentiates itself from the other bright and vibrant Oregon white wines is in the aromatics. Smoke and flinty minerality like you might find in Sancerre or Pouilly Fume frame the citrus and floral aromatics. That crispness follows through on the palate and Grüner has great weight as well. This wine is in the $15 neighborhood and you can find it at Whole Foods and New Season in Portland and in Seattle it can be had at the awesome boutique picnic as well as PCC. 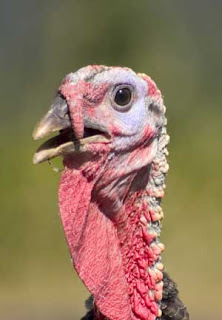 Turkey time. I'm proposing two options for your bird wine this year and I think you'll find both of deliver on that acid we've been talking about as well as depth of flavor and complexity. 2011 Evening Land Vineyards Seven Springs Gamay Noir Friend and fellow wine writer Jameson Fink just did a short piece for Foodista magazine suggesting wines you might bring for different kinds of hosts. I'm giving you a wine for someone like Jameson. Gamay Noir is a super wine geek wine, it's best known in it's Beaujolais Nouveau iteration but it can be a really vibrant and sophisticated wine. This is a red wine that zings and pulses. Lots of zippy dark fruit; like biting into a blackberry just a touch too early in the season as well as a hint of a savory earthen character this Gamay Noir from 30 year old vines brings a complexity and depth that can compliment the gamy elements of turkey (pun intended) and cut through some of Aunt Marilyn's heavy gravy. The wine retails for $24 and can be had at Liner & Elsen in PDX and Whole Foods through out the Northwest. The 2011 Stoller Vineyards Rosé of Pinot Noir so, there's probably not any of this wine left. And that goes for a lot of the great rosé that was made in 2011 throughout the Willamette Valley. My hope is that you might still have a bottle of it lying around and if you do, Thanksgiving and turkey is begging for rosé. I know that there's nothing outside the box about Pinot Noir, but bringing that bright bursting acidity of a rosé of Pinot Noir is where I'm at least hoping to get some originality points with you. Let's be real people, Summers around here are far too short for us to relegate these great wines to that little window. I try to hold onto three or four bottles of my favorites to help me get through the dark and the cold and all those rich meals on the holiday calendar. This rosé from Stoller is crazy good with strawberry fields forever on the aromatics as well as hints of citrus. The palate is bright and lively and delivers tart early season cherries and strawberries. This wine is long gone and you're not going to find a ton of rosé still lingering, the good stuff is long gone from the retail market, but here's hoping you've got one or two stashed away. Here's hoping your holiday table is surrounded by good people enjoying some amazing food and wine. Happy Thanksgiving from the Anthem.